HDW 2 (Hartl-Dengl-Weinberger 2), also known as Sharpless 2-200 and PNG 138.1+04.1, is an ancient planetary nebula (PN) in Cassiopeia at RA 3hr 11m 29s and DEC +62d 45m 5s. The bright part of the object is about 6′ in diameter, North is toward the lower left and the field is ~32′ x 32′. According to Weidmann and Gamen (A&A, 526, A6, 2011) the central star (CSPN – central star of a planetary nebula) is a binary (bc-CSPN); a designation “corresponding to binarity for the cool CSPN”. The object’s color is a mixture of the blue/green OIII and red/magenta H-a. It is roughly circular with a central area having marked striations and a dark region toward the south, surrounded by a thin gap and then what appears to be an outer bright ring, or halo that also has some fine structure. We are probably looking at the edge of an expanded, spherical shell from an earlier expulsive event. Beyond this, there is apparently an even older, diffuse outer halo lacking in structure and barely detectable with our system. 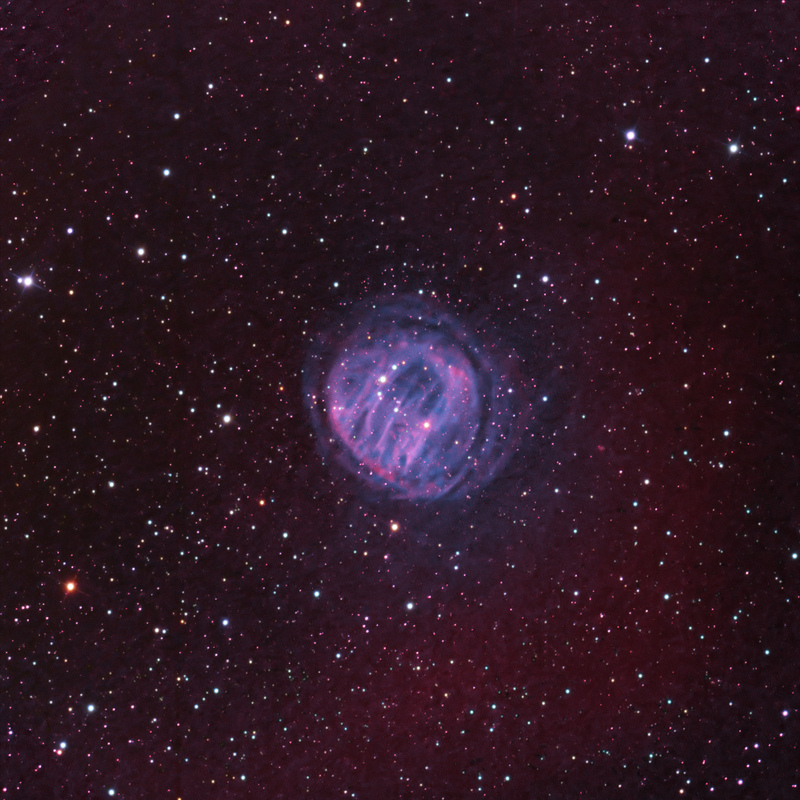 There is a fainter reddish arc of background H-a nebulosity surrounding the object opening toward the north. This image was compiled from 22.5 hours of 3 nm OIII and H-a narrowband data and an additional 75 min. of RGB for star color using a G2V sunlike white point. The H-a data were mapped to red/magenta and the OIII data were mapped to blue/green.